After the initial stage of moving onto more than just milk, I tried to ensure that Charlie got a range of flavours and textures whilst weaning. I did start to puree my own fruit and veg for him, but to be honest it was easier to buy little pouches for him, especially once I went back to work. I started by giving him fruit for a pudding or a snack and his first taste of fruit was banana and pear. He preferred the pear but now he absolutely adores banana, which is funny as I can't stand them, or the smell! I've been very strict with his drinks as well and he only ever gets water or milk in the morning and evening. I am not a fan of juice for little ones, I don't think it's necessary and it just encourages them to like or want sweet things. 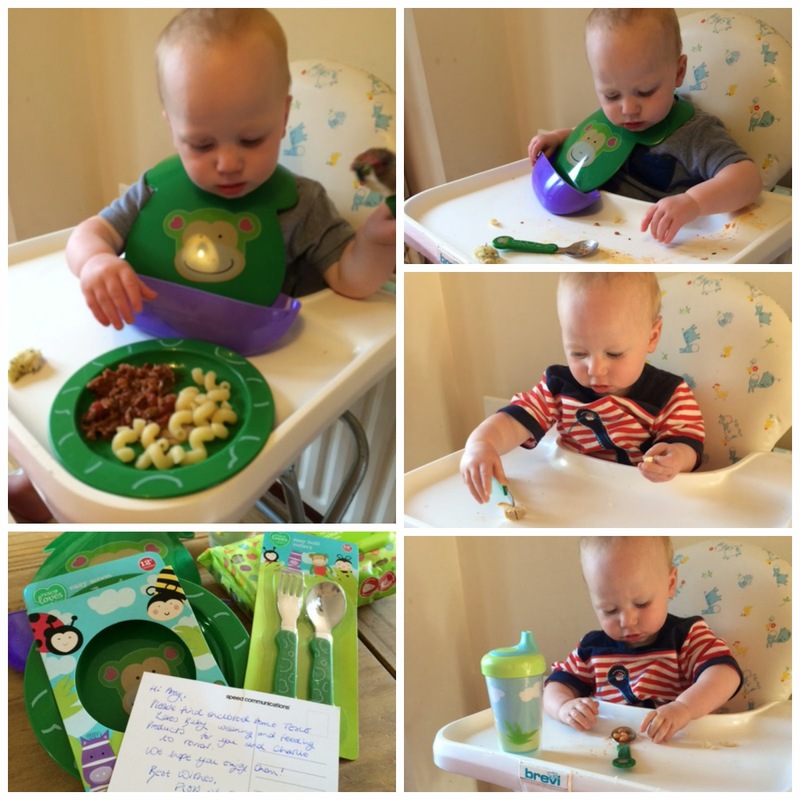 Before I gave him meals that we eat too, I used Annabel Karmel's website for baby recipes. Charlie is a big fan of the lentil puree from there (although i don't puree it now like I did when he was smaller) and the fruity chicken curry. In fact, he loves proper curry now as well. When I moved him on to more lumpy textures, my fear was (and still is), choking. It's a horrible thought and I really worry about it every time he eats! I was shocked to read that bread is often one of the food items that babies or toddlers choke on, along with meat and apples. Tesco held their first ever baby food festival last month and although I missed it in store, their online site was just as useful. They teamed up with Annabel Karmel and you can find her top weaning tips on the website as well as lots of lovely recipes for the various weaning stages. I tried Charlie with the stage 3 mini meatballs and he loved it! I'm going to make him the pea and Parmesan risotto next, which I think I will make for the whole family as it looks and sounds yummy too! There's also a video on there, where experts talk about what foods to avoid whilst weaning and also distinguishes between gagging and choking, which I found really helpful. The Tesco Baby Food festival website is packed full of really helpful tips on various topics all connected to weaning and feeding your baby/toddler. There's expert advice and lots of really great recipes. I found that the recipes elsewhere on the internet were all a bit limited. But Annabel Karmel offers really good alternatives which are lower in salt and packed full of flavour. It was really interesting to see how other parents go about weaning, as often I think new parents worry if they are doing it right. Again, the Tesco Food Festival site has loads of information about this and includes a top list of healthy food for toddlers. I was asked if Charlie would like to receive a few bits to help him on his weaning journey and of course I whole heartedly said yes. Charlie received a plate, a set of cutlery, a drinking cup, a bib with a tray to catch any food that gets dropped and of course some baby wipes to clear up the mess afterwards! We have really struggled to get liquid into Charlie, besides milk, as he couldn't get the hang of the cups, but this one has been his favourite and he now drinks from it properly and even points to it when he wants a drink. The plate and cutlery are being well used, although he has decided lately to use his fingers to eat - even when eating cottage pie! I think the bib is a great idea too - especially for clean freaks like me! I hate mess and it makes me feel sick picking up cold mushy food off the floor. This bib catches a lot of food, altnough Charlie still likes to throw some it on the floor! Yuck! *Tesco sent me the feeding items for free, but the thoughts and opinions in this post are all my own.